The desire to slow the process of aging is a major concern for everyone as we get older. Wrinkles form and spider veins appear, ruining one’s youthful appearance. We are left to reminisce of the days when we didn’t even know these would be problems. Thankfully, there are plenty of ways to prevent aging and improve your health at the same time. Skincare has a connotation of being connected to beauty or feminine ideals. However, this is simply a myth. After all, many men use high-quality beard balms, which is a product that falls within both skin and hair care. The truth is that proper skin care is more so a matter of health and self-preservation. Taking care of yourself is not a matter of gender roles or conformity, but this societal stigma has left men in the dust. Many of us have been left wondering what the options are when it comes to anti-aging solutions. Anti-aging cream is perhaps the fastest and most effective ways to prevent aging. This is due to its properties and easy application. It is an appealing tactic because it is strictly topical, unlike many other medicines or wellness approaches. It is also something that you only have to do once a day or once a week. You can do it before you go to sleep or first thing in the morning. This makes it easy to incorporate into your normal routine. 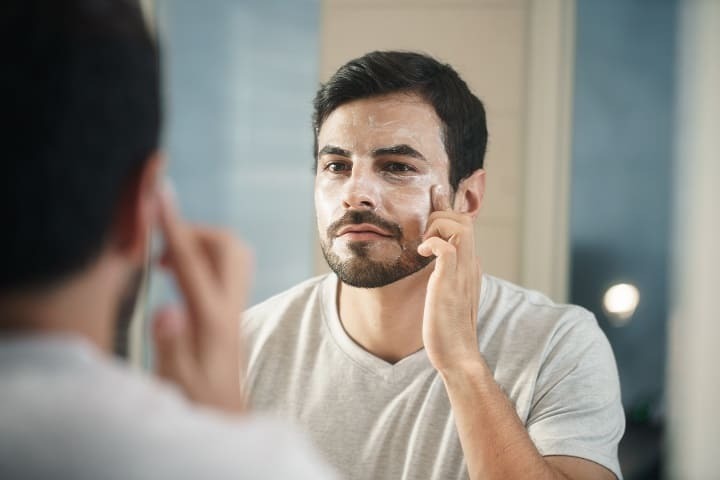 Here, we’ll go over the essentials when it comes to finding the best anti-aging cream for men for your personal regimen. What Features Should the Best Anti-Aging Cream for Men Have? There are many qualities that anti-aging creams should have in order to be serious contenders for purchase. Dehydrated skin can pull and wrinkle much more easily than hydrated skin. This is not unlike dried versus fresh fruit, which is why staying hydrated is so important. As such, any anti-aging cream worth your money will have hydrating qualities. Accessibility is one highly important factor to consider. After all, if you find a product that works for you, you want to be able to purchase it on a consistent basis. Anti-aging creams are not a one-time purchase. Instead, when you find the right one, you’ll soon find that it is a necessity in your medicine cabinet. Additionally, the product should be in a language you know. That may seem like a no-brainer, but Korean skin care has taken off on a global scale. As effective as Korean skin care products may be, many of their products can be sold with the original Korean label and no English translation. The problem here is that unless you speak or read Korean, you won’t know what ingredients are in it. There are some ingredients that the best anti-aging creams have. And there are some ingredients you should flat-out avoid. We’ll discuss the ingredients in more detail in a minute. But for now, suffice it to say, if you can’t read the label, buyer beware. Lastly, your anti-aging cream should come from an established brand. That way, you know you can trust its efficacy. There are numerous brands out there with faulty products. This clutter the shelves of drug stores and even beauty shops. The bottom line is to do your research on the manufacturer prior to your purchase. There are many different skin types, and all of them require different forms of treatment. The kinds are oily, dry, sensitive, normal, and combination. Understanding the category that you fit under will better assist you in taking care of your skin. This is true of any personal care product. For instance, knowing your skin type will allow you to use more effective face washes for your circumstances. The same can be said of anti-aging creams. Knowing your skin type and how to adhere to its needs is extremely important for both preventing aging and taking care of your skin on a daily basis. Oily skin produces oil in excess and results in pimples, blackheads, and breakouts more than usual. That said, it is also a skin type that usually means thicker skin and thus fewer natural wrinkles, so congratulations! There are some tips and tricks to keep in mind to control your oily skin, however. This includes carrying around blotting papers to pick up any of the excesses in times of need. 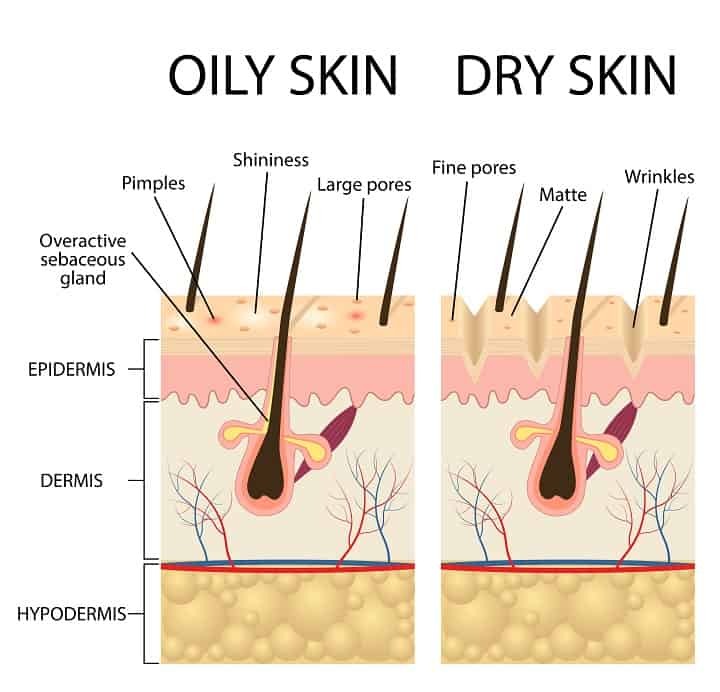 Dry skin requires more moisturizing than other skin types to make up for the lack of oil you absorb naturally. It is important not to over-exfoliate your skin if it’s dry. Unfortunately, this means that as fun as it may be to unwind after a long day in the best pajamas and a face mask, there does come a point of diminishing returns. There is also dehydrated skin, which lacks water. This should not be confused with dry skin (despite how often they already are). Anyone’s skin can be dehydrated, and this is actually imperative to combat in the battle for younger skin. Sensitive skin should naturally be approached with more caution than the other types. That’s because this type is prone to redness and irritation. One thing you should definitely keep away from with sensitive skin is any kind of face mask or exfoliator with microbeads. These can irritate your skin even further. Normal skin means you have no obvious or persistent problems to address in your skin type. This is a rare find. That does not mean it does not require upkeep, however. It just means you should refer to a more standard routine of toners, serums, light moisturizers, and the like. Combination skin is a skin type of multiple varieties that coexist, most commonly being oily and dry. Many individuals will be oily in one section of their face but dry in another section of their face. This means the routines will slightly differ for different areas. You will need to tend to both of these areas properly. It could mean possibly investing in twice as many products for efficiency. What Ingredients Should the Best Anti-Aging Cream for Men Have? When it comes to the best eye cream for men, select ingredients are necessary, as they are extremely helpful in deterring the aging process. 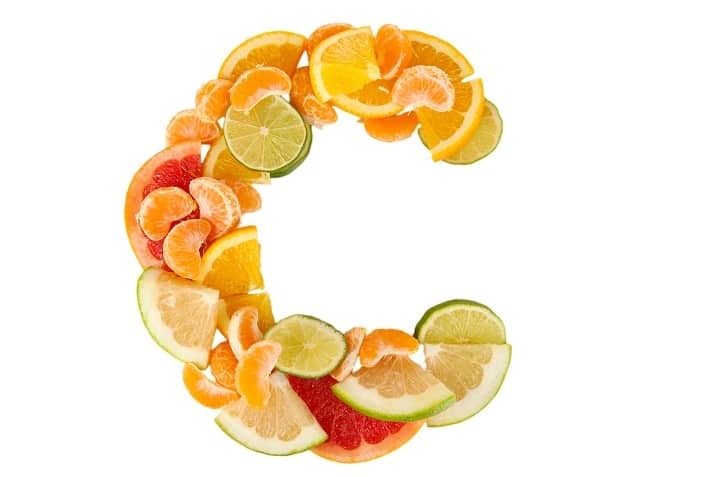 Vitamin C is one of the most essential factors of anti-aging cream. This is because all people, especially those of fairer skin tones, are susceptible to sun damage. Sun exposure can very easily lead to premature wrinkles and aging. Tea extracts are some of the most natural and effective means of preventing aging. Green tea extracts especially are extremely useful in keeping wrinkles at bay. As an added bonus, they don’t have any real adverse side effects because these extracts are natural. Finally, retinol is an antioxidant that is particularly good at preventing wrinkles and other signs of aging. In general, antioxidants are good to look for. Their ability to fight against free radicals that deconstruct skin cells is ideal for an anti-aging treatment. Atrocious as it may seem, many skin care, hair care, and beauty products actually have ingredients with damaging side effects, either in the short-term or long-term. Here are some things to stay away from now to prevent a world of trouble sometime down the line. Alpha hydroxy acids, commonly referred to as AHAs, are helpful in moderation. However, they can be irritating and break down your skin’s outermost protective layer if used too frequently or in quantities too large. Retin-A is a compound that is used to battle wrinkles. As such, it is common in a wide assortment of anti-aging treatments. However, it is also prone to drying out skin. As such, you should use any product containing Retin-A with care. For those of you with naturally dry or sensitive skin, it’s best to avoid altogether. Similarly, glycolic acid is an element that both works against wrinkles while also resulting in occasionally red, dry, and irritated skin. Parabens are frequently found in various lotions and creams. However, you should avoid these if possible. These chemicals have been linked to reproductive complications, breast tumors, and several other health complications. They lead to effects that no individual should have to experience, especially if they can help it. As was mentioned earlier, keep away from microbeads, especially for those of you with sensitive skin. Microbeads are harsh on skin and dangerous to the environment. So, there is a wide range of different anti-aging creams out there. Which is best for you, and how do you know? Well, let’s break down the many things to consider when trying to decide which product would suit your needs. The thing to remember is what kind of skin type you have and what that type requires. Here’s a quick breakdown of how to choose the best one for you based on skin types. If you have dry skin, make sure your anti-aging cream is moisturizing. Moisture will help restore your skin and fight wrinkles. If you have oily skin, make sure the product is oil-free. 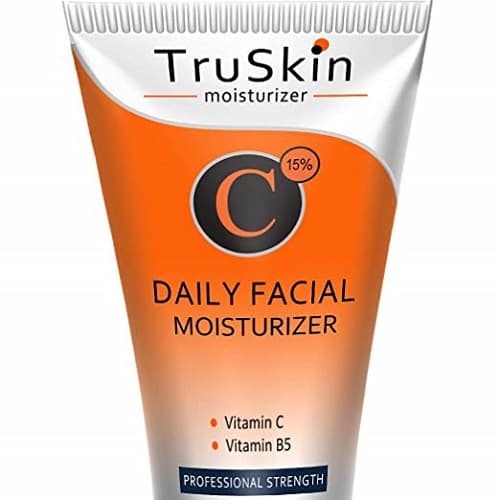 Those with sensitive skin can often benefit from moisturizing creams. In addition, avoid creams that are scented as the chemicals can irritate skin. These lucky guys can pretty much pick any cream they like best. If you have combination skin, you’ll have to select creams for the different types (oily, dry, sensitive) on different parts of your face. 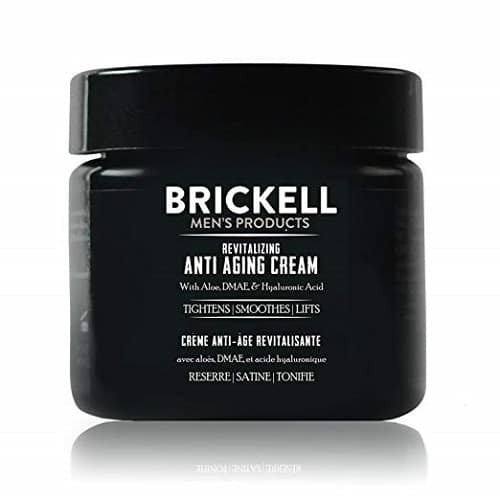 When a list of ingredients in an anti-aging cream includes aloe, hyaluronic acid, green tea and other natural and organic ingredients, like that’s the case with Brickell Cream, you know you have a powerful product in front of you. When used in the morning and at night, this cream will effectively reduce wrinkles, fine lines, crow’s feet and other persistent signs of aging. After a regular application, your skin around the eyes will look tighter, smoother and much firmer. Your age or type of skin are irrelevant because this item works for every man. Make sure that you clean the area around your eyes with purifying gel or face wash to remove any impurities before you apply the product. About a dime size is enough per one application. When used twice a day, it will last you approximately 45 days and your face will smell refreshing thanks to the peppermint, eucalyptus and lemongrass scent. 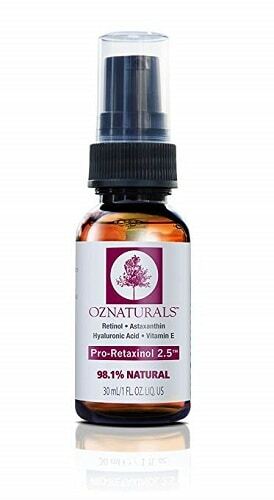 Retinol-based formula of OZNaturals Anti-Aging Serum is regarded as one of the most efficient solutions when it comes to fighting wrinkles, fine lines and hyperpigmentation. 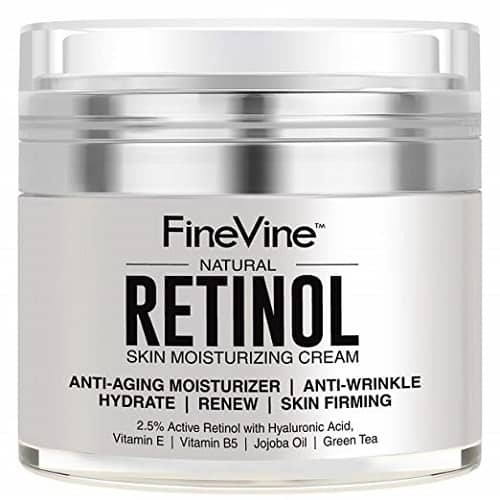 Because it contains hyaluronic acid, vitamin E and astaxanthin, the possibility of irritation, that is common among other retinol-based products, is significantly reduced. You can use this serum to restore elasticity, firmness and thickness to your skin. It’s also very efficient in treating a skin that’s damaged by the sun. No matter the skin type, you can use it if you take some preventive measure such as gradually incorporating the product into your skincare routine if your skin is sensitive. Besides that, make sure to use an SPF 30 sunscreen all the time while applying the serum and a few days after you stop using it. 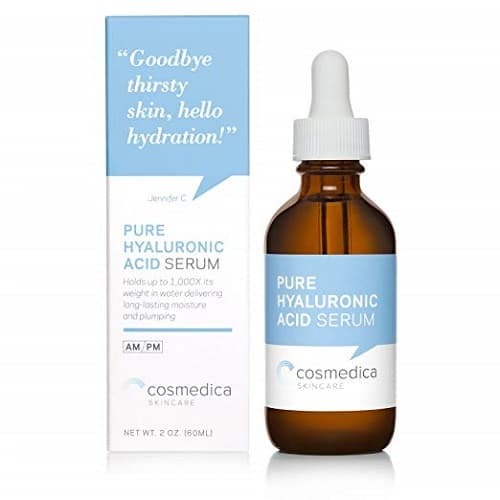 Almost instant improvement in skin tone and softness are two of the things you’re going to notice since the first day you start applying Pure Hyaluronic Acid Serum. With extended use, you’ll spot some progress with the premature signs of aging, many of which will diminish. This primarily includes wrinkles and fine lines. Gentle to all skin types, including the sensitive one, this product doesn’t contain parabens, oils, dyes, fragrances or fillers and is vegan-friendly. Even if you’re struggling with skin problems due to damage caused by sun, after some time, this serum will help you and fade any signs of damaged skin. Note that a little goes a long way, so don’t use too much per application. There is no greasy residue after the use of this product, but it might dry out your skin a bit. 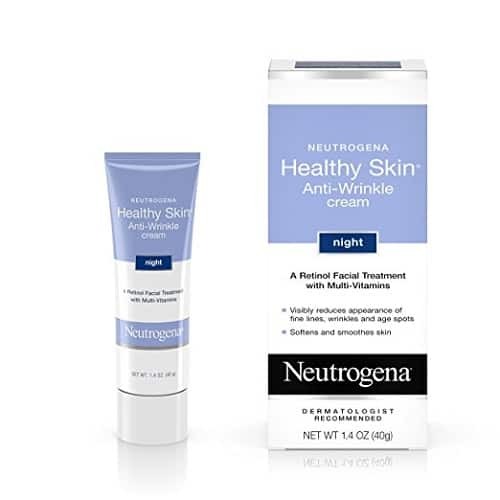 Formulated with retinol, Neutrogena Anti-Wrinkle Cream works deep into your skin in diminishing wrinkles, fine lines and other signs of aging. In just one week, you’ll notice significantly fewer wrinkles with no clogged pores or greasy skin. Other ingredients are pro-vitamin B5, vitamin E and special moisturizers that are proven to aid in softening and tightening the skin. The skin absorbs the cream reasonably quickly, without the heavy feeling some other similar products tend to leave behind. Finally, if you’re battling with dark spots or skin discoloration, this product is bound to help you in less than one week, when you’ll start noticing considerable improvements. 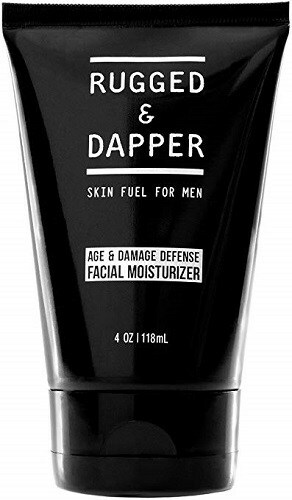 Anti-aging cream and soothing aftershave lotion in one Rugged & Dapper is crafted from natural and organic ingredients such as aloe vera, jojoba oil, shea butter, green tea, etc. All of them work together in preventing or eliminating wrinkles, breakouts, fine lines, uneven skin tone, irritation and damage caused by the sun. The formula is entirely fragrance-free, so you don’t have to put up with the smell you don’t like the whole day. Soaking into your skin quickly, this cream will give your face matte finish, with no greasy residue at all. Coming in a 4 oz tube, it’ll last you for a pretty long time. Just make sure to test it on your skin, given that it’s not suitable for skin prone to acne or sensitive skin. Lightweight anti-aging formula based on vitamin C and powerful antioxidants of TruSkin Cream is something you can use no matter the skin type you have. The fact that it’s plant-based means you should be careful before using it on your face because it can cause you irritation and breakouts if you’re allergic. Take a patch test on a small skin area one day before applying it to make sure it’s a good fit for you. What you can expect to achieve with this product is smoother, hydrated and refined skin texture without dark spots, hyperpigmentation and wrinkles. After only a few days, your skin will feel much tighter. Use it in the morning and then again at night, especially around your eyes, chest, neck and on your forehead. By hydrating your skin and restoring its elasticity, Fine Vine Cream considerably decreases wrinkles, fine lines, dark spots and blemishes. You’ll notice an improvement in your skin tone as well as less acne, breakouts and clogged pores. Penetrating deep into the skin, this product doesn’t make your face feel greasy. Instead, it leaves it firm, soft and smooth. Active retinol, hyaluronic acid, vitamin E and jojoba oil are just some of the ingredients that make the potent blend of this product. Some customers claim that their skin became dry or irritated after they’ve used it. To ensure this doesn’t happen to you, make sure to patch test if you’re allergic to its ingredients. 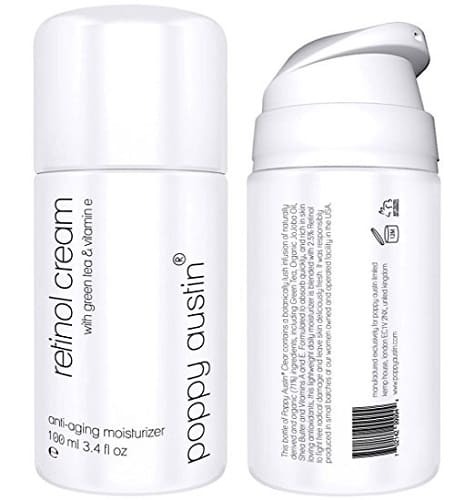 The mix of vitamin A, retinol, aloe vera, green tea and other make the recipe of Poppy Austin Cream, designed to feel lightweight and promote healthier and younger looking skin. Aloe and green tea have the most important role in reducing fine lines, wrinkles, sun damage spots and improving your skin tone and texture. There are no synthetic fillers, fragrances, colors or any other harmful component that could damage your skin. In fact, the product is rather quickly absorbed and suitable for all skin types. Apply it two times a day to restore elasticity and firmness to your facial skin, but also to deeply cleanse, tone and exfoliate it. It won’t cause you dryness or irritation, but it might make your face look slightly greasy. Also, it has an odd, not that pleasant smell, which you might dislike. 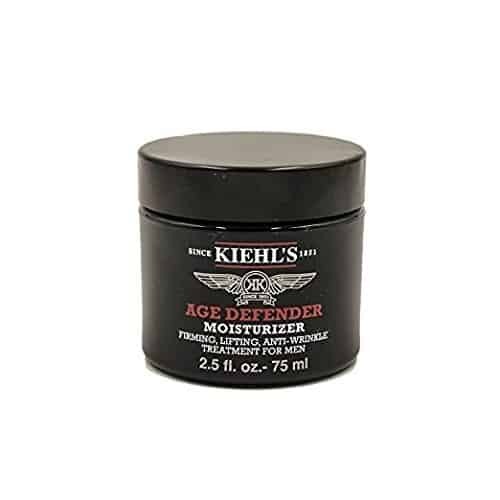 Where all other anti-aging creams for men fail, Age Defender by Kiehl’s really makes a difference with its effective, rejuvenating formula. The reason why more men don’t use it is probably the price because this product is very pricier than almost all of the others with the same purpose. What’s more important is that this cream actually works, so you know you’re investing in quality. Very soon after the first application, you’ll notice fewer wrinkles and fine lines around the eyes. Just a small amount is needed for the full coverage, so it’ll last you for at least one year. With no fragrance or harsh ingredients added, this cream feels really nice and light, making your face, neck and other critical areas noticeably younger with each repeated use. A large part of skin care – anti-aging or not – is simply about routine. You’ll see the best results if you keep up a solid routine over time. This can mean applying the cream right before you go to sleep. Or you can shoot for first thing in the morning. Just make sure you are applying your anti-aging cream at the recommended intervals. Creams should be applied evenly in a thin layer by clean hands. Once you apply it, leave it on your face. Don’t wash it off as you would with other treatments. When in doubt, read the label. Skincare can get complicated as it is both health and chemistry. Reliable brands will explain how to use their products. Specific details might include whether to apply before or after a cleanser or moisturizer. Some products will also say to wash off twenty minutes after application. One anti-aging product that many people forget about is also one of the most imperative: sunscreen. The daily use of SPF is vital to upholding high-quality skin and combating the possibility of damaged skin. It prevents sunburns, sun poisoning, or later down the line, skin cancer. Additionally, constant hydration is absolutely vital to healthy skin. Our bodies are approximately 55-60% water, making it highly significant to our livelihood and ability to thrive. This is clear in all aspects of health, and skin is no different. Your daily water intake is typically suggested to be half an ounce to a full once for every pound you weigh. This means it will vary for every individual. Be sure to keep up with this suggestion. Also, you will want to compensate for times of dehydration. Peak dehydration happens after working out, eating, or drinking anything other than water. Finally, smoking tobacco can increase your susceptibility of aging significantly. It can discolor your skin and give you plenty of wrinkles. So if you smoke, stop, and if you don’t, don’t start. Many people try to find quick and easy solutions to deter aging once the signs start to show. 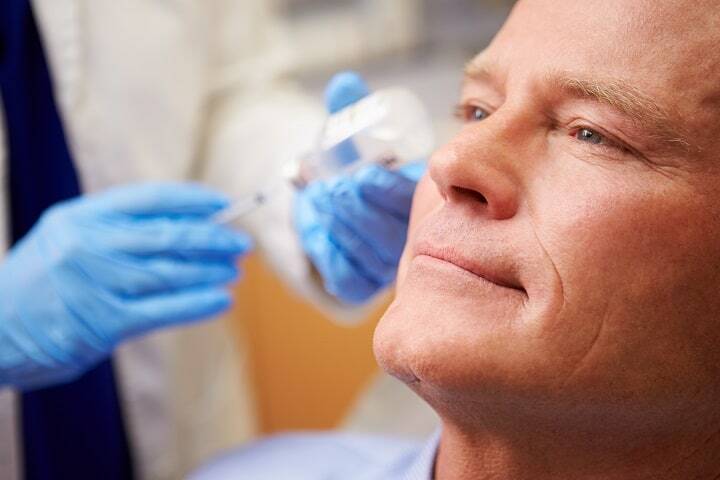 In recent years, Botox has become a rather normalized means of reducing your wrinkles and retaining the look of youth. However, not everyone is impressed by its methods. Indeed, many stick with more non-invasive methods such as topical creams or general health improvements. Botox is a very temporary solution, as well. It lasts from about three to four months. It should only be applied around the eyes and in the forehead. This means that wrinkles in any other location would still be visible. Also, it’s worth keeping in mind that injections always run the risk of going awry. Technological advances are certainly helpful. However, they are not yet in the position of being actual miracle workers. Also, doctors are not always reliable, especially if you don’t do your homework on them first. Plus, the side effects of slight pain, bruising, or swelling can be worse for some than it was for others. In the worst cases, if the injections are done wrong, they can be applied to nerves that weren’t intended to be paralyzed, which can result in droopy eyes. Ultimately, with an anti-aging cream, you have significantly more control over than with the direct chemical injections of Botox. In addition to an anti-aging cream, a good beard care regimen is vital to a youthful look. Shaving, styling, and trimming beard hair can all affect the hair follicles. In turn, this affects the skin around the follicles. Dry, inflamed skin around the beard hair can age skin over time. That’s why it’s best to use the best beard conditioners during your regular showering. Afterward, for styling or grooming, apply some of the top beard oils to restore the nutrients to the skin that got depleted while washing your face. There are numerous products for your facial hair aka beard moisturizers that should keep the hair and skin around it fresh and youthful looking. Aging is a process that many of us want to keep at bay as best as we can. Thankfully, advancements in beauty have allowed us just that. These innovations have awarded us the knowledge fight the onset of aging. Beauty, hair care, and skin care are so frequently marketed towards women as though they are the only ones who have any interest in appearance. However, men have hair, skin, and the same desire to retain those features well into older age. Whether it’s natural conditioners for men to keep hair looking soft and youthful or an anti-aging cream, men should be able to use these personal care products without fear of judgment. Hopefully, in time, the tolerance for and accessibility of anti-aging products for men will improve. It will allow men to sustain a healthier relationship between “masculinity” and taking care of oneself. Out of the plentiful ways that one can prevent aging, anti-aging cream is among the quickest and most effective for all users, including men. It is a product that was manufactured for the specific purpose of deterring and/or even reversing aging. With it, you have a much better chance of retaining your youth in later life. Everyone deserves to be in charge of the way they look and the way that they feel. This is one truth that does not alter with age. Photos from: diego_cervo / depositphotos.com, PicsFive / depositphotos.com, Neokryuger / depositphotos.com, belchonock / depositphotos.com, londondeposit / depositphotos.com. monkeybusiness / depositphotos.com.